CO Architects’ renovation for UCLA’s Psychology Tower, originally designed by Paul Revere Williams in 1967, features a full interior modernization to provide new student amenity spaces and collaboration opportunities. Renderings: CO Architects. Los Angeles — Two buildings designed by critically acclaimed African-American architect Paul Revere Williams, FAIA, are under renovation at the University of California, Los Angeles (UCLA). Williams — a groundbreaking pioneer who overcame racial biases during an era of profound social inequality — gained notoriety for designing celebrity homes in Southern California, as well as spearheading several landmark projects. His most notable work includes the Ambassador Hotel, Los Angeles International Airport’s Theme Building, and the Beverly Hills Hotel. In 2017, he was posthumously awarded the American Institute of Architects’ highest honor, the Gold Medal, for overcoming numerous barriers and paving the way for future generations of African-American architects. Leading UCLA’s renovation endeavors is Los Angeles-based CO Architects, which recently completed a remodel of the La Kretz Botany Building lobby. The new lobby’s signature element is an originally planned, but abandoned, 285-square-foot wall mosaic that recalls the iconic banana leaf wallpaper installed in the Beverly Hills Hotel’s Lanai Room and Fountain Coffee Room. Working off a design found in Williams’ original drawings, the design team carefully brought the mural to life, using 72,796 three-quarter-inch-square vitreous glass mosaic tiles in 14 hues inspired by the hotel’s wallpaper. In addition to the lobby renovation, CO Architects is currently designing a full-building upgrade to target LEED Gold certification, with anticipated completion in 2022. The renovation will include innovative learning spaces and state-of-the-art laboratories that support teaching and research of plants, ecology, and conservation. The second project is a major renovation of the Psychology Tower, currently under construction and anticipated for completion in 2020. The design includes significant upgrades throughout the building to improve the quality of classrooms, research environments, and study spaces. The Psychology Tower is pursuing LEED Silver certification. “We’ve had a longstanding client relationship with UCLA that goes back to the late 1990s with the seismic renovation and conservation work achieved with the campus’ landmark 1929 Royce Hall,” said Scott Kelsey, FAIA, Managing Principal at CO Architects. “When addressing the complexities of institutional architecture, particularly those of a historic caliber, it’s imperative to respect the integrity of the site, as well as create environments conducive to learning, teaching, and research. Originally designed by Williams in 1959, the 37,128-square-foot La Kretz Botany Building, located along the northern edge of the Mildred E. Mathias Botanical Garden, consists of research and teaching laboratories within UCLA’s department of Ecology and Evolutionary Biology. In addition to the striking mosaic tile wall, CO Architects expanded the lobby space and increased visibility to the adjacent garden. By removing and replacing existing solid walls at the exit stair with a concealed roll-down fire shutter, the architects created unobstructed views from the front door to the botanical garden, enhancing visual connections that were previously hidden and reinforcing the building’s purpose for scientific exploration. The lobby also received a new glass-and-aluminum entry, polished concrete floors, and a linear wood-grille ceiling system with upgraded lighting. CO Architects is currently designing the complete building renovation to reinforce the design concepts initiated with the lobby project. The renovated building will increase visibility for the work produced by the Ecology and Evolutionary Biology Department, as well as affiliated faculty from the Institute of the Environment and Sustainability. To create a productive work environment, an office suite will incorporate a blend of private, shared, and open spaces. The use of glass will increase transparency into the previously hidden research labs, while open floor plans will inspire researcher collaboration and efficiencies. Conference rooms, huddle spaces, and alcoves will offer meeting areas for various types of interactions. When complete, the building will contain laboratory space capable of housing up to 15 principal investigators and their graduate and postdoctoral researchers. In addition, renovations are currently in progress for the newly renamed Psychology Tower, formerly called Franz Hall II, located west of Charles E. Young Drive East and along the south plaza with the popular Inverted Fountain. 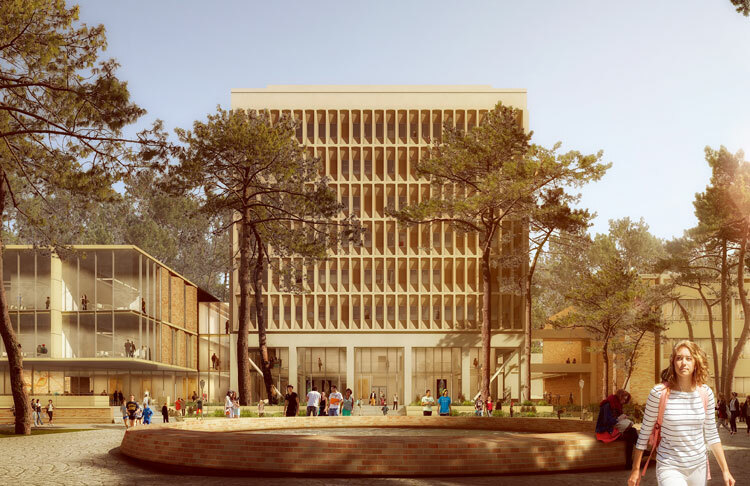 Originally designed by Williams in 1967, the 125,000-square-foot, 11-floor building, with eight levels above grade and three basement levels, will feature a full interior modernization for UCLA’s nationally top-ranked Psychology Department. The expanded lobby will feature a two-story curtain wall encasing the building and second-level, double-height arcade to provide student amenity spaces, study areas, and collaboration opportunities. The material finishes used recall the historically significant marble walls, terrazzo flooring, and circular dome lights, as they were damaged over time and unable to be retained. A complete renovation of the upper levels of the building will provide new offices, classrooms, conference rooms, dry labs, and elevator upgrade. The ends of the corridors will feature private study “nooks” that provide views to the exterior. The renovation will also include a seismic retrofit for the building, which required a rigorous testing program during the pre-design phase to develop a retrofit scheme to minimize visual impact to the building’s existing historic character.